Notre Dame will play a game at Fenway Park this season, so they’ve combine with Under Armour to pay homage to the fame Green Monster at Fenway Park. It’s the latest unveil for their “Shamrock Series” uniforms that they will wear for their Nov. 21 game against Boston College at Fenway Park. 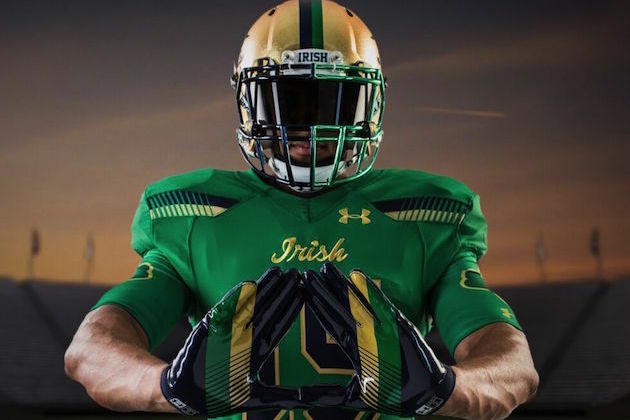 The uniforms also honor the Fighting Irish’s history. There are 11 breaks in the Notre Dame stripe (on the helmet and pants), representing the team’s 11 national championships.